Virginia’s suffocating defense has shut down teams all season, and Miami was the next victim. The Hurricanes were held to their lowest scoring output of the season in a 59-50 loss to the No. 1-ranked Cavaliers Tuesday night at the Watsco Center. 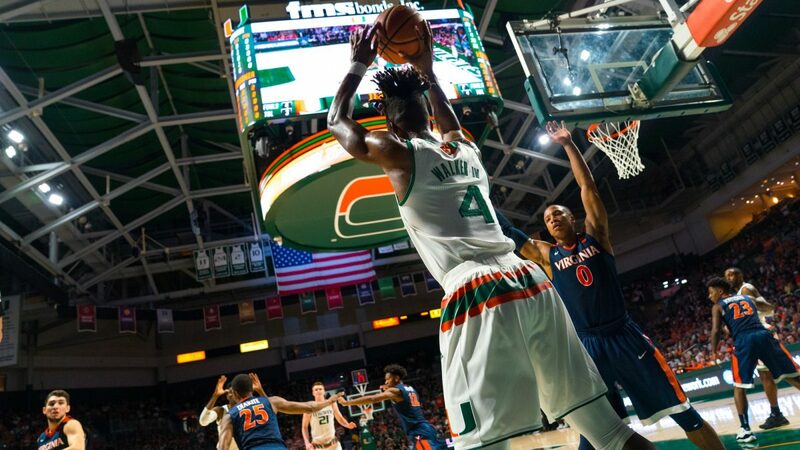 UM (18-7, 7-6 ACC) has now lost two in a row after winning five of its previous six games. Virginia (24-2, 13-1 ACC), who came in as the highest-ranked team in the country for the first time since December 1983, regains momentum after having its 15-game winning streak snapped in a 61-60 overtime loss to Virginia Tech Feb. 10. 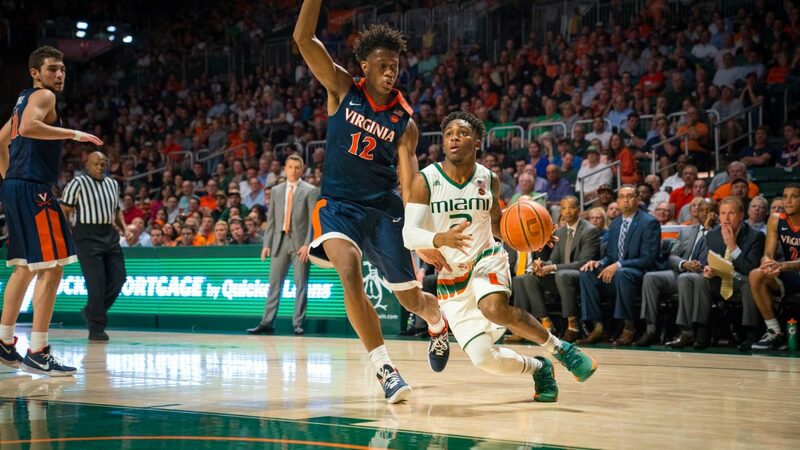 Freshman guard Chris Lykes scored a career-high 19 points, but he was the only Hurricane to find his rhythm. Dewan Huell, Lonnie Walker IV and Anthony Lawrence II, three of the Canes best scorers, combined for just eight points on 2-of-16 shooting. After scoring in double-figures for seven consecutive games, Walker has scored six points in each of his last two while shooting only 4 of 17 from the field. Guard De’Andre Hunter scored a game-high 22 points to lead the Cavaliers. Kyle Guy, who averages 15.3 points to lead the team, scored 13 points. Center Jack Salt tied a game-high with seven rebounds. Miami never led in the contest but had a handful of runs to cut the deficit to within five points in the second half, but Virginia always had an answer. The Cavaliers shot 46 percent from the field, consistently slicing through the Canes’ zone defense with methodical passing to the open man. The Hurricanes shot just 38 percent from the field and went through multiple scoring droughts lasting more than three minutes. They move to 1-5 when trailing at halftime. The Cavaliers, who hold their opponents to a nation-best 52.8 points per game, negated all flow to the Hurricanes’ offense. Miami had just six assists. After losing 72-70 against Boston College Feb. 10, a game in which Miami went scoreless for the final 6 minutes and 17 seconds, UM fell out of the AP Top 25 rankings. Previously, it was ranked No. 25. Miami next plays Syracuse at noon Feb. 17 right back at the Watsco Center. Virginia returns home to play Georgia Tech at 7 p.m. Feb. 21 in Charlottesville. – The Canes have struggled to close out games at points in the season. UM went through scoreless stretches late in the second half against Georgia Tech, Duke, Boston College and now Virginia. – Larrañaga was an assistant coach at Virginia the last time the Cavaliers were ranked No. 1 in December 1983. – The last time Miami beat a No.1-ranked team was in 2013 in a 90-63 win at home against Duke. Isaiah Kim-Martinez can be reached on Twitter at @isaiah_km.